We think the Besser Natural Area is the best hike for young children. But here are eight other adventures that are guaranteed to pique their interest in the outdoors. 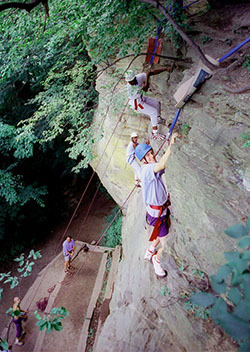 Rock climbers on the Grand Ledges, which can be seen while hiking the Ledges Trail. Grand Ledge, the only natural place to do any serious rock climbing in Michigan, also makes for a fun adventure for children, even if they’re years away from lacing up a pair of rock shoes. The town west of Lansing is named after The Ledges, ancient sedimentary outcroppings that tower above the Grand River and have become a popular recreational and educational area. Through much of the year, rock climbers gather at Oak Park on the north side of the river. But families should head to Fitzgerald Park, an Eaton County park on the south side, for a far less dangerous adventure — a 2-mile, round-trip walk along the river that provides a close-up view of The Ledges. If there are climbers on The Ledges, you can get a closer view of them after the hike by driving to Oak Park. Kids are krazy about karsts! A karst is a limestone region of conical depressions called sinkholes that include abrupt ridges, caverns, and underground streams — all of which make for interesting hiking terrain. Michigan’s most visible karsts are found along the Sinkholes Pathway, a 2.4-mile loop around five such depressions, some more than 100 feet deep. If that’s too much in one day for a child, there’s a 0.8-mile cut-off trail that allows you to tour the first three sinkholes, which are the steepest. Better yet, spend a weekend kamping in karstland. The Sinkhole Area is a 2600-acre tract of the Mackinaw State Forest which includes several lakes and four rustic campgrounds. A five-minute walk from the Sinkhole Pathway trailhead is Shoepac Lake State Forest Campground, with twenty-eight sites well spaced in a thick hardwood forest. The Bow Man is the most well known of the petroglyphs. It is believed that this figure represents a hunter. Woods, a gentle stream, the possibility of encountering wildlife, and easy hiking are reasons why the trail in Sanilac State Historic Site is such a good family outing. But what makes it an excellent adventure for children is the way the historic artifacts fill young minds with images of ancient hunters, Indian villages, and nineteenth-century loggers. The main feature of the park is a large slab of sandstone with dozens of carvings on it that archaeologists believe to be almost 1000 years old, dating back to the Late Woodland Period. They are the only petroglyphs ever found in Michigan. From the petroglyphs, a 1.5-mile trail winds through the 238-acre state park unit. Numbered posts along the trail correspond to an interpretive brochure available at the park entrance. From Memorial Day to Labor Day, the Michigan Bureau of History staffs the park with interpretive guides from 10 a.m. to 5 p.m. Wednesday through Sunday. Guides open the pavilion that contains the carvings and lead walks along the park’s trail system. Silver Lake State Park, located south of Ludington, is home to the Mac Woods Dune Rides, the famous tours through the most barren mountains of sand in Michigan. But most of the dunes is an area designated for hikers. From the pedestrian parking lot, a wooden stairway leads you from a forest to a 50-foot-high wall of sand that is literally pouring into the trees. This dune is quite a climb, especially for young children, but once on top, you’re rewarded with a view of Lake Michigan on the horizon, Silver Lake to the left, and towering ridges of sand right in front of you. The hike out to Lake Michigan is a one-way walk of 1.8 miles, with several steep slopes to climb. Families with children under the age of six or seven might choose to walk to Silver Lake instead, by heading south (left) at the top of the steps along the edge of the trees. It’s a 10- to 15-minute hike to where the steep dunes form the north shore of the lake. The view of Lake Michigan from Green Point Dunes. 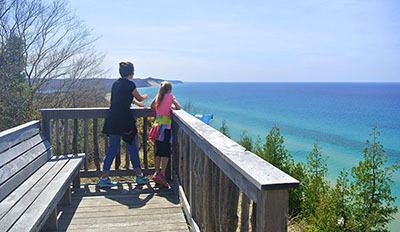 A half mile into the hike at Green Point Dunes Nature Preserve you reach the first observation deck overlooking Lake Michigan and just beyond that is the second deck, offering one of the most dramatic views seen anywhere along M-22. From that perch, you can gaze at open dunes towering above the shoreline, at the remains of a streamer that ran aground in 1873 or, if you arrive late in the day, the sun fading into a watery horizon. Sand dunes, shipwrecks and sunsets. But what makes this 2-mile hike such a great kid’s adventure is a beautiful beach serves as the halfway point, a place where the curious can explore the 19th-century shipwreck with just a mask and a snorkel. The City of Boston is only 150 feet offshore, angled in 7 feet of water with its stern buried in the sand bar and its bow occasionally less 4 feet below the surface of the lake. No scuba gear required for this wreck. 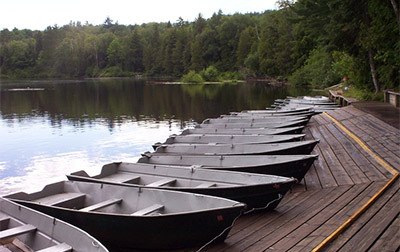 Rowboats at Lower Tahquamenin Falls. Sure, Upper Tahquamenon Falls, the second largest waterfall east of the Mississippi River, is impressive. It’s an Upper Peninsula jewel that measures 200 feet across, descends 50 feet into a sea of mist and foam, and has a thunder that can be heard the minute you step out of the car. But most kids will find the Lower Falls at Tahquamenon Falls State Park much more fun. Located 4 miles downriver, the Lower Falls are not nearly as stunning but are still beautiful and best viewed by combining an easy rowboat trip across the river with a short walk around an island, an ideal outing for any short-legged hikers. The mile-long island loop passes one display of tumbling water after another. Along the way parents and children alike will be kicking off their shoes and wading into the river to let the water cascade across their legs. Try doing that at the Upper Falls. This 3-mile trek, an easy and level walk in Pictured Rocks National Lakeshore, combines the rugged shoreline of Lake Superior with scattered remains of shipwrecks and the preserved AuSable Light Station. One, of course, is directly responsible for the other. From AuSable Point east to Whitefish Point was known as “the graveyard of the Great Lakes” to sailors in the 1800s, as dozens of ships perished along the exposed shoreline. Along the trail, you pass a pair of posted shipwrecks that can be viewed by descending to the shoreline. Once at the light station you can enjoy lunch while waiting for the daily ranger-led tour. The best part of the tour, maybe even the entire hike, is the climb to the top of the tower. It’s 100 steps up to view the original Fresnel lens inside and the sweeping Grand Sable Dunes outside. 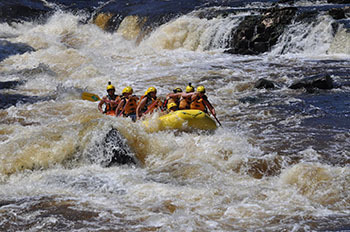 Rafters surviving the Piers Gorge rapids. During the summer this 3-mile hike offers an impressive display of white-water rafting, especially if you arrive on Saturday or Sunday afternoon when local rafting companies are running trips through the gorge. To sit on the edge of the gorge and watch rubber rafts crash into swirls of white water is exciting for children and adults alike.